At the end of March, a delegation of experts from the associated companies of the LIFE project SARMIENTO, in the Murcia area of the D.O. 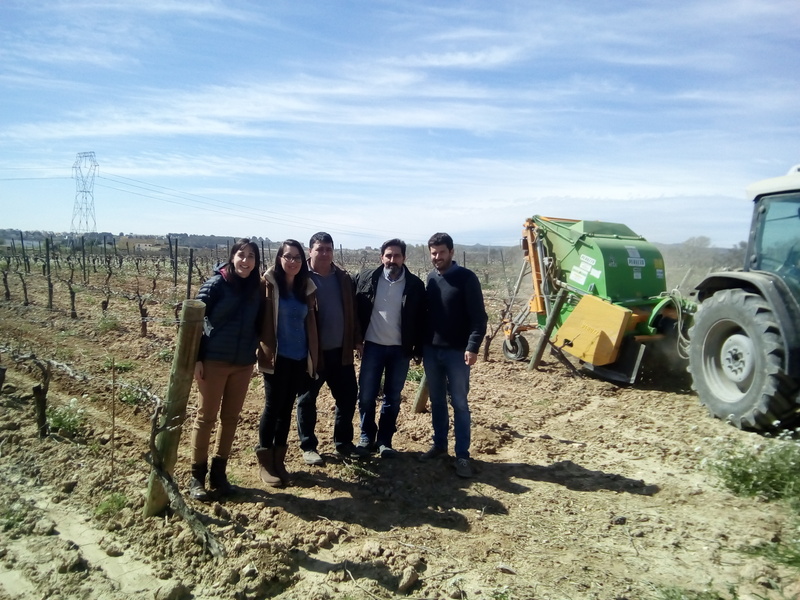 Bullas, headed by Juan José Pajares of the wine cooperative El Rosario, together with Cristóbal Sánchez, of Microgaia Biotech and Meissa Garcia of Eurovértice Consultores visited the VINEYARDS4HEAT project. The objective of the SARMIENTO project is to avoid the burning of the pruning in the same vineyard, without any use, which causes environmental problems such as the emission of greenhouse gases, the risk of forest fires or the destruction of necessary organic matter by the soils of arid zones. This project, which has the similarity with VINEYARDS4HEAT to take advantage of the remains of the pruning of the vine, is based on the recovery of this pruning, transforming it into a compost of quality with bio-stimulating properties that can be used as organic support of the own vineyards. So this project wants to reduce the impact of the burning on the vineyard of the remains of the pruning, improving the resilience of the soil, introducing the circular economy and reducing the use of chemical fertilizers. The delegation was received by those responsible for the VINEYARDS4HEAT project of the Vilafranca Town Council, Jordi Cuyàs, Laura Carbó and Carme Ribes, with whom they visited the District Heat of La Girada, the pruning collection system with those responsible for NOU VERD Ton Grau and Camil Rahola and the facilities of Caves Vilarnau to verify on the ground the project of using the remains of pruning of the vine to produce thermal energy.